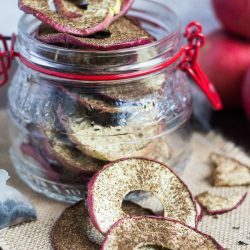 Chai Spiced Apple Chips are the perfect healthy snack for everyone. Sugar free yet full of flavour, these chips make the most of new season apples. Don't have a dehydrator? I have provided Trish's instructions below for drying them in the oven. 3 Tablespoons chai spiced teabags or 3 chai tea. Grind the tea and the cinnamon quill to a fine powder in a coffee grinder or a mortar & pestle. Pass the powder through a fine sieve to remove any coarse material. Slice the apples horizontally into 6mm (1/4") slices using a knife, mandoline or apple gadget. Sprinkle the chai spice over the apple slices. I used a fine sieve to get an even coating over the slices. Lay the slices on dehydrator trays, ensuring that the slices do not overlap. Dry until crisp. The time taken will depend on your machine. Preheat the oven to 90C. Divide the spiced apple slices between the baking sheets. Do not allow the slices to overlap. Bake for 1 hour. Flip the apple slices over. Bake for 1 hour. Flip again. Bake for 1 hour. Remove from oven and allow to cool.